Allan Johnston did not attempt to shy away from the blunt truths about Kilmarnock's situation. The 5-0 defeat by Hearts at Tynecastle starkly exposed the limitations of a team that has failed to respond to the manager's efforts this season, and he delivered some harsh words to his players afterwards. Johnston will now feel the pressure of relentless scrutiny. The reaction of the supporters last Sunday was personally critical of the manager, and there was little sympathy at the annual general meeting on Monday night. While the newly-appointed board members were warmly received by the fans amongst the shareholders, there were pointed questions to Allan Johnston about his team selections. His inference that he is not adamant about his strongest starting line-up will not have helped. He did, though, receive the backing of the chairman Michael Johnston, who insisted that his namesake will remain in place even if the team has to contest the relegation play-off. There is still time to avoid that fate, and victory over St Mirren on Wednesday night would represent significant progress. Even so, there is a sense of Kilmarnock finding turmoil on the field just when the club had generated some stability off the pitch. The prospect of relegation, with the team sitting second bottom and fighting to escape the relegation play-offs, will be troubling since revenue streams will be affected despite the presence of Rangers and Hearts in the Championship next season. Yet Kilmarnock have had to deal with the potential of financial troubles in the past. Whilst carrying the debt left over from the building of the Park Hotel next to the stadium - which eventually fell to around £9m - Kilmarnock were severely restricted. Managing the debt, and tightly reining in budgets, was all that could be achieved, but the cyclical nature of football finances meant that there were always potential points of alarm to be negotiated. There is clarity now, with a debt reduction deal having been struck with Lloyds Bank. That has seen ownership of the hotel pass to a company created and owned by local businessman and Kilmarnock investor Billy Bowie, and Michael Johnston. The club can no longer call upon the revenues the hotel generates, although a commercial relationship will be maintained, but nor will debt payments have to be serviced. 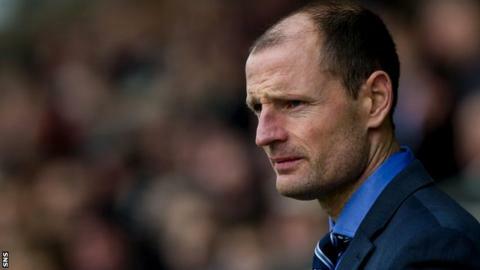 Boardroom changes have also brought fresh ideas and impetus to Rugby Park, as well as reducing the notion amongst supporters who are critical of Michael Johnston being the sole figure in charge of the club's affairs. He reiterated that he will stand down as chairman in the near future but he will retain his influence, having effectively acted as executive chairman in recent years. After months of conflict, with many supporters having embarked on a campaign of withdrawing financial support, a potentially brighter future has been secured. Allan McLeish, of kit sponsors QTS, was part of the Kilmarnock Futures consortium which held talks with Michael Johnston about a takeover. Those discussions eventually ended without resolution, but McLeish has since insisted that QTS will continue their sponsorship agreement, which suggests an improved working relationship with Michael Johnston. Such relationships will be critical if the worst fate was to befall Kilmarnock on the pitch. The visits of Rangers and Hearts in the Championship would soften the blow, but prize money is reduced, which will affect cash flow. There is more money available now in the Championship than there used to be, but it's in the order of £733,000 for coming bottom in the top flight and in the order of £385,000 for winning the Championship. Ticket prices would likely be reduced in the Championship, along with other sponsorship and advertising deals, and corporate hospitality. The debt reduction deal provides Kilmarnock with more stability, but further investment might have to be sought to curtail cuts. Bowie has already provided financial support, but the rebuilding of relations between the club and other wealthy fans, as well as the supporter base as a whole, needs to continue. Not least because while one season in the Championship will be made more manageable by the presence of Rangers and Hearts, a second campaign would put severe strain on the finances. Kilmarnock are no longer weighed down by debt, but on-field problems are now a drag on the mood of the fans. Allan Johnston could yet motivate his players out of their recent slump. The bigger picture is of a team that needs rebuilding. Having proved himself a manager of great potential when he led Queen of the South to promotion last season, Johnston has yet to prove his credentials in the top flight. Kilmarnock are not free of anxiety yet.